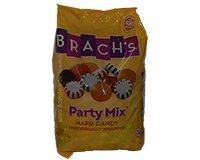 Brach's Party Mix contains a blend of Cinnamon Disks, Butterscotch Disks, Star Brites Spearmints, Star Brites Chocolate Miints, Strawberry Filled Hard Candy and Star Brites Peppermints. Brach's passion is making moments of your day just a little bit sweeter. Brach's products have been made with the finest, wholesome ingredients for more than 100 years. Brachs - since 1904. Ingredients: Corn Syrup, Sugar, Natural and Artificial Flavors, Salt, Citric Acid, Cocoa Powder, Red 40, Yellow 5, Sodium Citrate, Titanium Dioxide (Color), Red 3, Blue 1, Pectin, Yellow 6, White Mineral Oil, Sunflower Lecithin. Manufactured By Ferrara Candy Company. Product of Mexico.